Some background on Dr. Edwards’ study is useful. In April 2016, R2 Resource Consultants, a company under contract to Portland General Electric, released a Lower Deschutes River Macroinvertebrate and Periphyton Study. This was a four-year study, mandated by the Pelton Round Butte Project’s Clean Water Act certification, that aimed to compare post-SWW conditions in the lower Deschutes River to pre-SWW conditions that were documented in a baseline study. The conclusions in the R2 study were perplexing. Among other findings, the authors stated that “[s]tudy results did not identify large changes in the macroinvertebrate community before and after SWW implementation.” The DRA Science Team, which had been following the development of this study closely, identified several problems with the final report, and in the following weeks worked with several outside experts to assess the data analysis and statistical methods used in the study. Then, a few weeks after the R2 report was issued, the Oregon Department of Environmental Quality (ODEQ) stepped in. In a letter to PGE, ODEQ deemed the R2 report inadequate and deficient in several key components, and requested that PGE provide a response to correct the “serious shortcomings” in its analysis. PGE responded to the ODEQ letter by stating that it would address the agency’s concerns and would summarize this additional work in an addendum to the original report—a process PGE estimated would take 6-12 months to complete. It now has been 19 months since that response letter was sent, and the promised addendum still has not issued. In the same letter, PGE stated that despite its shortcomings, the initial report—which had already been submitted to the Federal Energy Regulatory Commission (FERC) —satisfied PGE’s obligations under the FERC license for macroinvertebrate monitoring. In other words, PGE claimed it had met its requirements with a report that ODEQ had identified as deficient in several respects. We at the DRA felt it was essential that an accurate analysis of the pre- and post-SWW macroinvertebrate data be completed as quickly as possible. To that end, we contracted with Dr. Edwards to perform a thorough and accurate statistical analysis of the same data used in the R2 report. Dr. Edwards is highly qualified to perform this analysis, as his PhD in environmental science included extensive use of multivariate statistic—an analytical technique commonly used to assess changes in macroinvertebrate communities. The purpose of Dr. Edwards’ analysis was to assess the characteristics of the macroinvertebrate community pre- and post-SWW. The results of Dr. Edwards’ analysis are truly concerning. Data collected in the springtime showed that the post-SWW community has significantly fewer mayflies, stoneflies, and caddisflies—all species that are more sensitive to poor stream conditions. Data from both the spring and fall seasons showed an increase in taxa that are more tolerant to poor stream conditions, including worms and snails. As a result of Dr. Edwards’ analysis, there is sound science confirming what many have suspected for years: SWW operations are significantly altering the ecology of the lower Deschutes River. The discharge of surface water from Lake Billy Chinook has caused serious, negative impacts to water quality in the lower river, and those impacts are leading to significant changes in the insect community below the dam complex. Negative changes to aquatic insects are a serious concern, as they support the entire food chain within the river, particularly resident trout, juvenile salmon and steelhead, and wildlife along the river – including birds and bats. Sound science establishes that these changes are statistically significant. DRA believes strongly that these changes can and must be reversed. Presumably, if PGE’s initial analysis of this data had been sound, efforts in the intervening months and years could have been focused on addressing the ecological decline in the lower river. We certainly hope that work will commence, at long last, but we are proceeding with legal action to ensure no further delay. For more information about Dr. Edwards’ analysis, read Rick Hafele’s summary of the report here. 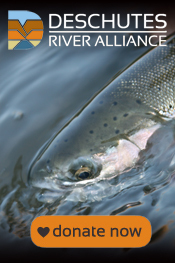 This entry was posted in Deschutes River Alerts, Deschutes River Alliance News, Ecological Changes, River Thoughts, Uncategorized and tagged Aquatic Insects, aquatic invertebrates, Deschutes River Alliance, Lower Deschutes River, Pelton Round Butte Hydroelectric Complex, water quality. Bookmark the permalink.